* Any form of exercise keeps your readers healthy! 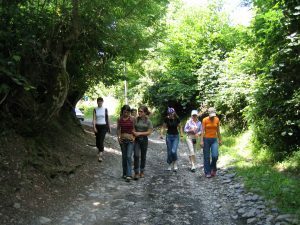 Reading Group Choices presents a few walking book groups — two in the United States, two in the United Kingdom — who love to take their discussions outside. 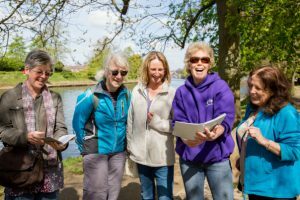 Use their approach to plan your own walking group session! Plus, we’ve added some outdoor-themed reads to complement your walk. The Alpine Trails Book Group combines their love of reading and the outdoors by organizing monthly hikes and discussions. They select nature-themed books to read, and explore the trails around Seattle, where the group is based. Their blog features reading lists and accounts of past meetings, including a special mushroom-hunting expedition. The group is geared toward women but accepts all who wish to join. Visit their site or Facebook page for more information. The Gail Borden Public Library in Elgin, Illinois sponsors this monthly walking group. First the members take a 45-minute walk along a track or a route along the Fox River, and then they return to the community center for a discussion. Recent reads include The Great Alone by Kristin Hannah and The Other Einstein by Marie Benedict. Visit the library’s website to see the full calendar of selections. The group is free and open to all. The York Bike Belles organization formed in 2014 in the city of York, England to promote cycling and healthy exercise. Their event offerings include a Walking Book Group, free and open to the public. Each month, the group selects a theme and provides recommended titles. (A recent theme was “Animals”.) Participants can choose a suggested title or read a book of their own choice on the theme. Everyone shares and discusses their book during a one-hour walk, followed by a visit to a café. Visit their website or Facebook page for more info. This walking book group turns six in 2019! The Number Seven bookshop in Dulverton, England hosts a quarterly walk and book discussion in the woods. Participants purchase the book from the store as a “ticket”, and walks last roughly two hours. Recent reads include Everything Under by Daisy Johnson and The Essex Serpent by Sarah Perry. Visit the website to view the reading list from previous years. Now that your circulation and inspiration are picking up, here are a few books about walking and the outdoors to get you started! Drawing together many histories–of anatomical evolution and city design, of treadmills and labyrinths, of walking clubs and sexual mores–Rebecca Solnit creates a fascinating portrait of the range of possibilities presented by walking. 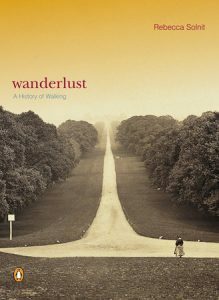 Arguing that the history of walking includes walking for pleasure as well as for political, aesthetic, and social meaning, Solnit focuses on the walkers whose everyday and extreme acts have shaped our culture, from philosophers to poets to mountaineers. She argues for the necessity of preserving the time and space in which to walk in our ever more car-dependent and accelerated world. For over a decade Michael P. Branch has been writing about life in Nevada’s Great Basin Desert with an audacity, lyricism, and wit all his own. 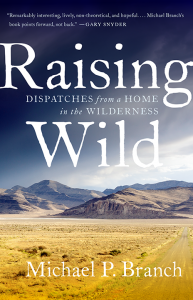 In Raising Wild, Branch offers an intimate exploration of the western high desert. Here we find the wild and extreme land of caliche and juniper, where pronghorn antelope run and mountain lions stalk, where wildfires and snowstorms threaten in equal measure, and where Branch, his wife, and their two curious little girls brazenly live among the packrats and ground squirrels, rattlesnakes and scorpions. In Branch’s hands, this exceedingly barren and stark landscape becomes a place teeming with energy, surprise, and an endless web of connections that ultimately includes his family and home. When Helen Macdonald’s father died suddenly on a London street, she was devastated. 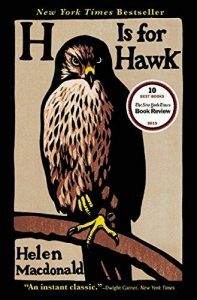 An experienced falconer—Helen had been captivated by hawks since childhood—she’d never before been tempted to train one of the most vicious predators, the goshawk. But in her grief, she saw that the goshawk’s fierce and feral temperament mirrored her own. Resolving to purchase and raise the deadly creature as a means to cope with her loss, she adopted Mabel. Heart-wrenching and humorous, this book is an unflinching account of bereavement and a unique look at the magnetism of an extraordinary beast. In thirty-six thrilling days, Melanie Radzicki McManus hiked 1,100 miles around Wisconsin, landing her in the elite group of Ice Age Trail thru-hikers known as Thousand-Milers. In prose that is alternately harrowing and humorous, McManus takes you with her on an “into-the-wild” Ice Age experience through Wisconsin’s forests, prairies, wetlands, farms, and far-flung small towns. Follow along as she worries about wildlife encounters, wonders if her injured feet will ever recover, and searches for an elusive fellow hiker known as Papa Bear. 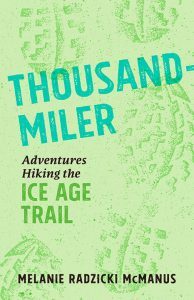 Woven throughout her account are details of the history of the still-developing Ice Age Trail—one of just eleven National Scenic Trails—and helpful insights and strategies for undertaking a successful thru-hike. Looking for more ways to add some variety to your discussions? See our post about reading plays with your group! And if good weather gets you thinking about summer, see our recommendations for taking a seasonal approach to your reading.